I’ve been working on some new paintings for charismatic Southwestern Birds, intended to be both standalone prints and components of a new skinny. 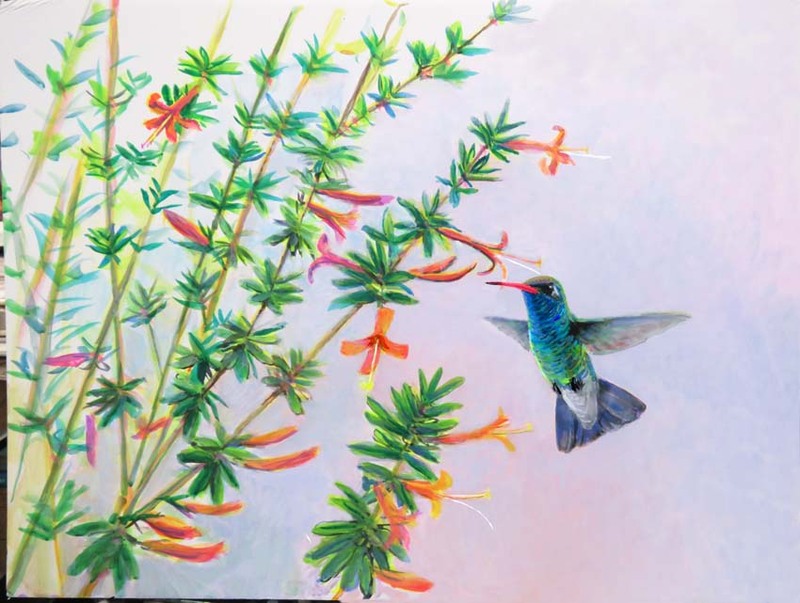 The painting above is of a Broad-billed Hummingbird based on a shot from a recent sightings blog of a Broad-billed Hummingbird working over a Desert Honeysuckle plant. 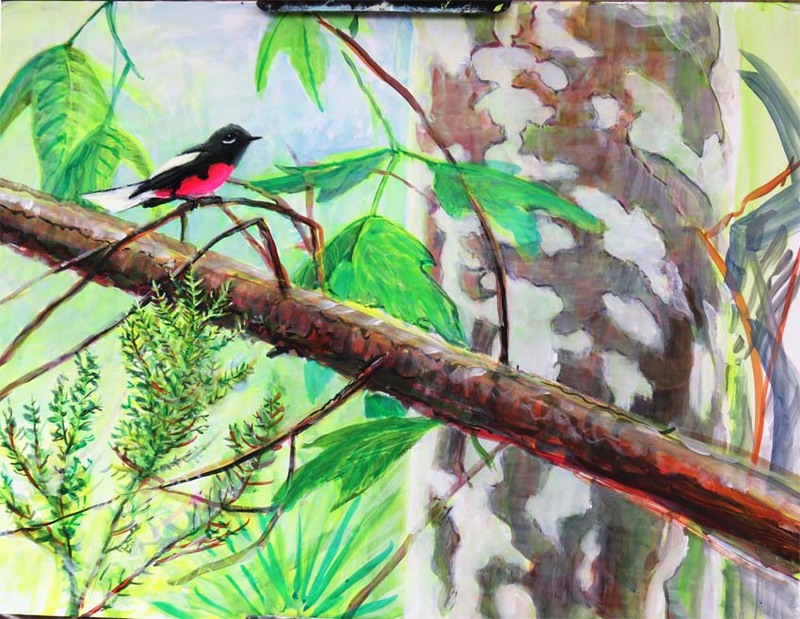 A Painted Redstart here forages, flashing it’s white tail (I believe a name change is underway and perhaps this will be called a Painted Whitestart) in front of a Sycamore trunk, an Apache Pine branch and an Alligator Juniper with a Yucca coming along in the background. This bird lives in wooded canyons, we see it in Cave Creek in the Chiricahua Mountains. 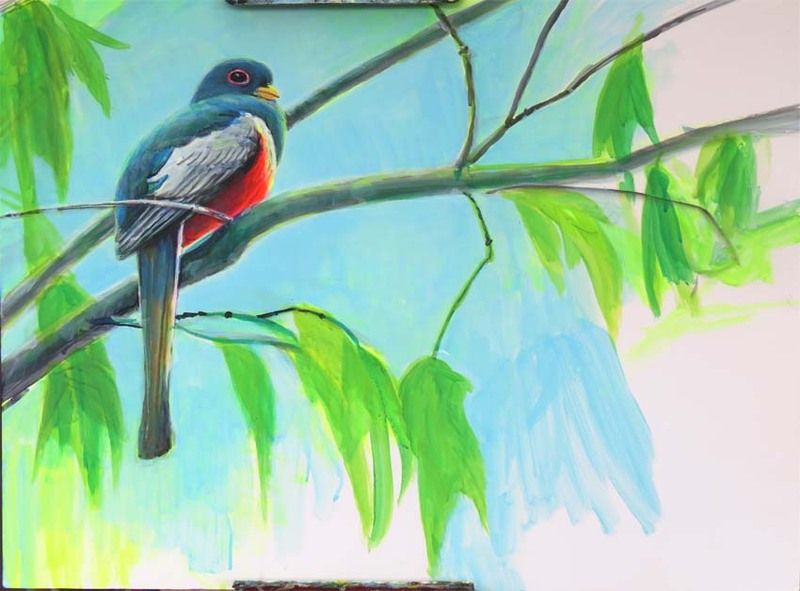 A male Elegant Trogon that resides in a similar habitat-zone sits on yet another Sycamore branch. 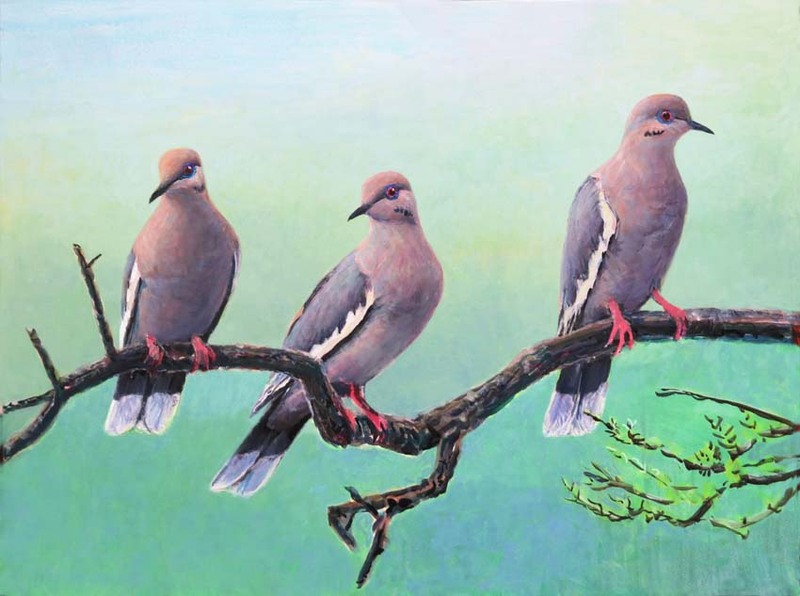 I already had started this painting of White-winged Doves that could go with this group in a skinny. And another SW standard is the Gambel’s Quail, I need to work quite a bit on this old start. 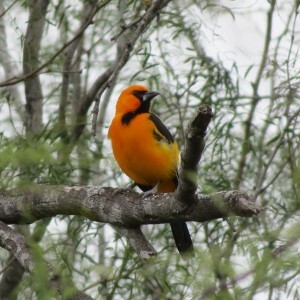 (looking for the photo) Also planning to start a Hooded Oriole soon. For a month of so I was all excited about the idea of “ceiling prints” that you could look up at. I’ve long been perplexed by what I consider to be a fact that paintings of flying birds don’t tend to work. That’s in my opinion because we don’t see in stop action, so if you paint a bird in the middle of a flap, it looks weird to us. But a soaring bird above appears still, and in fact it is, so the eye can take it in. Why not do a series, as many birds are particularly elegant looking in flight. So far, I’ve been surprised at how hard this is. 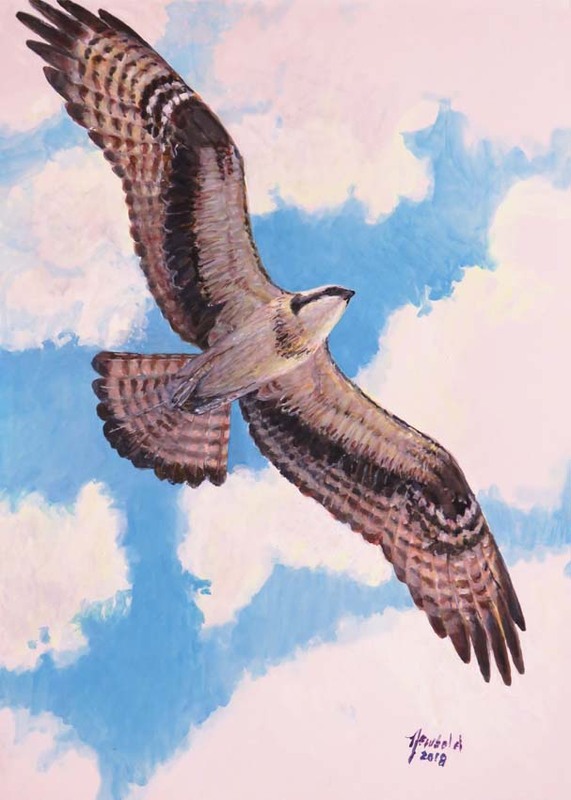 Here is an Osprey I did in May-June. The idea of a Ceiling Print is that it is not to be framed but simply backed with foamcore and bagged and carefully fastened to the ceiling so it won’t fall and hurt anyone, as you can see, glass isn’t a good idea for ceiling prints. 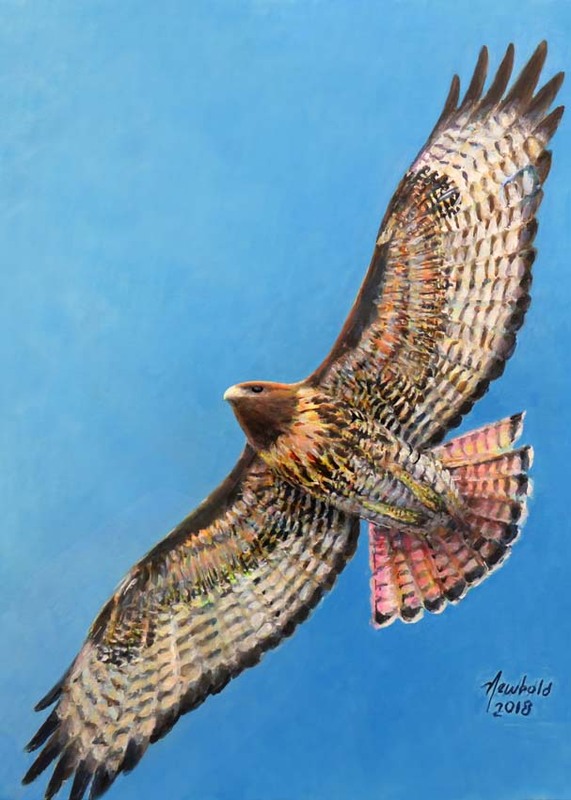 And a Red-tailed Hawk I did. Both seem to need work to me, especially the Red. There may or may not be more at this site about “Ceiling Prints.” If I go ahead with them, I know where they will be displayed at the store–High up and behind the shopper. The idea and hope would be to in some way recreate the excitement of a large bird flying overhead.